For multiple reasons, including price and healthy eating issues, beef consumption is down, which may be bad for ranchers but is probably good for the cows. Politics and culinary classifications aside, there is something marvelous about beef. The smell, the color, the resistance to your bite, the ability to readily mate with other foods, and that incredible umami sensory experience — all those elements make eating beef an experience that many people relish. For her corporate teambuilding events at Cooking by the Book, Suzen does try to entice her clients to experiment with different cuisines and foods. It can, however, be difficult to convince people into a meal of lamb or pork. Veal is forbidden. Mention “bunny” and people begin to cry. No, when it comes to protein, many people eat the trinity: beef, chicken, and salmon. Now, the magnificence of beef is that it is inherently good. But Suzen loves her meal to be grand, not merely good. For this beef, grandness is achieved by employing the perfect cooking technique and applying a spicy rub. Not a store bought rub fill with preservatives, but a rub you make on the spot with spices, sugar and even coffee. 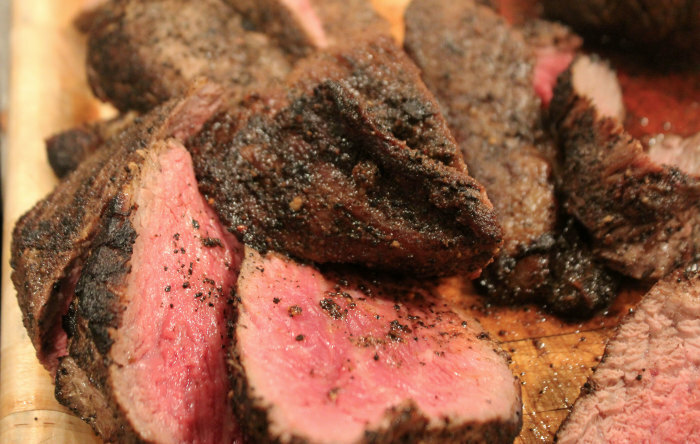 One taste of the blackened tip of the beef with this coffee rub, and you’ll be rooting for the ranchers and not the cows. Later this week I’ll post about caramelized rajas: onions and poblano chiles in a caramel marriage. And there is nothing wrong with making a meal of this beef and Caesar Salad complete with anchovy-based dressing. Make the rub by combining all rub ingredients and store in an airtight container. To prepare the meat, first trim the silver skin. The meat may have a thick layer of fat, some of which can be sliced off, but keep a good amount to help self-baste meat. To grill, prepare charcoal grill or heat a gas grill to high. Place roast on grill and sear one side well, 6 to 8 minutes, checking for flare- ups. Turn the roast and sear other side for about the same time. Then lower gas to medium-high or move the meat to a cooler part of the charcoal grill. To oven-roast, prepare meat with rub and refrigerate as instructed. Heat oven to 350 degrees. Add 2 tablespoons of olive oil or other cooking oil to a large, heavy ovenproof pan. On stovetop, heat on high until pan is very hot, then add tri-tip, fat side down. Turn heat to medium-high and sear roast for about 4 minutes. Turn the roast and put it in the oven. Cook it for about 10 minutes a pound, checking with an instant-read thermometer until it reaches 130 degrees for medium-rare.